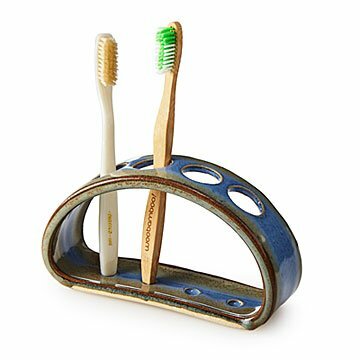 Upgrade that cup full of toothbrushes with this sculptural bathroom caddy by Monica Greco. It's time to upgrade that cup full of toothbrushes on your bathroom counter, and replace it with something that's as beautiful as it is practical. This sculptural bathroom caddy from ceramicist Monica Greco has room for up to four toothbrushes (or razors, or makeup brushes, or other slender toiletry essentials). She has applied her background in research science to developing special glazes, which give the piece an earthy loveliness and earn it a place of honor on the counter of your master bath or guest washroom. Looks great paired with Monica's matching ceramic soap dish. Handmade in Maryland. Large and a bit clunky. I purchased this as a companion piece to the soap dish. It's very large, and rather clunky and doesn't pair with the elegance of the other item. Probably should have sent it back, but didn't want to pay more shipping and it's tolerable. I like the uniqueness of this toothbrush/razor holder. It pairs well with the soap dish by the same artist. I was thrilled to find this toothbrush holder!! I bought this originally for my guest bathroom but liked it so much that I've decided to keep it for my master bath! Best brush holder I've seen. Maybe make it in a couple of different colors for different decors. I love the practicality of the toothbrush holder. The slots are large and the indentation that each brush rests in is substantial. It accommodates all toothbrushes, even the new wide ones. It keeps them separate from one another so no germs are shared! It's just what I've needed - attractive & practical. Purchased this item as a gift to me. Perfect shape to keep toothbrushes from falling into each other. Product easy to clean. Attractive enhancement to any bathroom. I just purchased the matching soap dish. Needs notches for toothbrushes enlarged. Wasn't able to use it as it arrived damaged.